Story time is even more #fun with #ReadwithMeScout! I received product as part of a promotional program with LeapFrog and MomSelect. I love reading and I want our children to love reading, too. We take time to read to our children, but the truth is- we can't always read exactly when our children want us to read to them. Read with Me Scout is a great alternative for the kids when Mom and Dad don't have the chance to read with them. 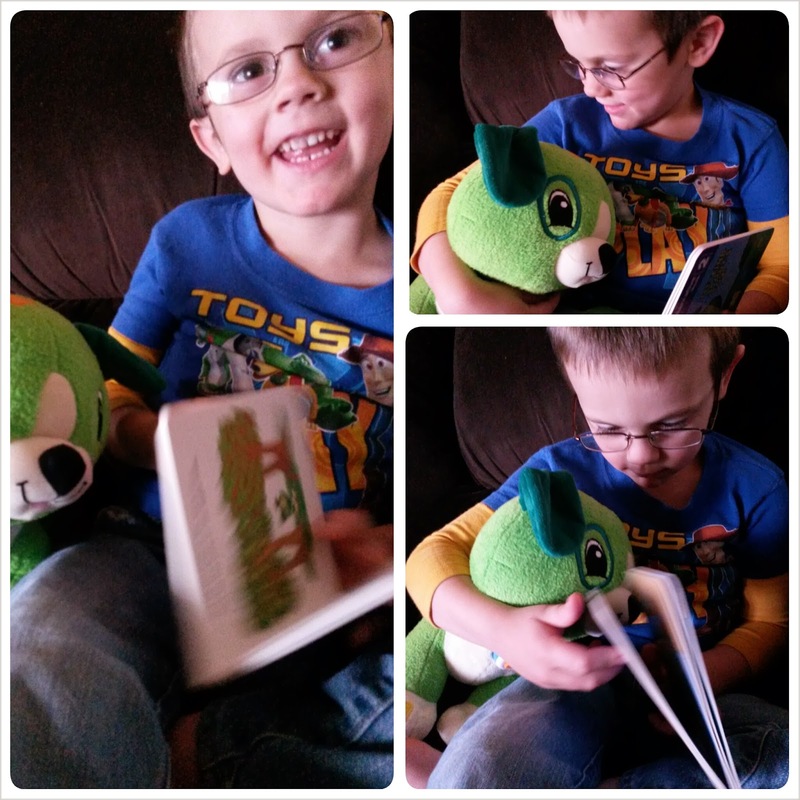 Read with Me Scout from LeapFrog is an interactive plush toy that helps children develop reading comprehension skills to get them on a path to reading. Not only does puppy pal Scout make reading fun with five interactive stories that he reads aloud, but he also responds to every pet, pat, hug and kiss! Simply press a button on his collar to start reading and pat his head to turn the page. Scout will ask your child questions throughout each story to create engaging learning moments and help build comprehension skills. Scout loves to sing, too! Switch into Sleepy Time Mode when it's time to snuggle and listen to relaxing stories and eight minutes of lullabies. I personally found that Scout was a little too sensitive. It seemed every time one of the kids moved Scout would think that s/he was giving him kisses or hugs. I also thought that the wait time to get back to the story after these interactions was a little long. Our 3 year old really wasn't able to listen and follow Scout's directions very well, but Nolyn (4.5y) did do better. Our 6 year old did the best with Scout, and seem to enjoy Scout reading to him the most. I do love the concept, and Scout has been great for times when I can help the kids learn how to use him. The kids also really seem to enjoy Read with Me Scout, even when they get a bit off track with the books. The books are also nice board books, so you don't have to worry about pages being ripped or lost easily (which is really nice). He is a cute addition and it looks like your son enjoys him too.